Schools are supposed to be a place of learning, not fear. It is important that school systems take every precaution when securing school grounds, and eliminating any outside intruders from disrupting the student’s ability to learn. Installing adequate fencing not only secures the perimeter of the property, but offers children a visible reminder that they are safe from harm, and they can place their entire focus on their lessons. Chain LinkChain link fencing is one of the most affordable types of fencing, as well as the most versatile. It allows for maximum visibility while securing the property from intruders. Chain link fences can be as short or tall as the school board desires. Taller fencing options prevent balls and other toys from being thrown outside. A chain link is also easily installed and can be repaired rather quickly if something happens to damage the fence. Welded Wire FabricOne of the best advantages of welded wire fencing is that it is extremely hard to cut or compromise. Even if it is hit with something as heavy as a car, it will bear the majority of the weight without being compromised or heavily damaged. This type of security fencing will not unravel and is much harder to break apart at the joints or seams. Welded wire fencing is less expensive than expanded metal fencing and installs easily. 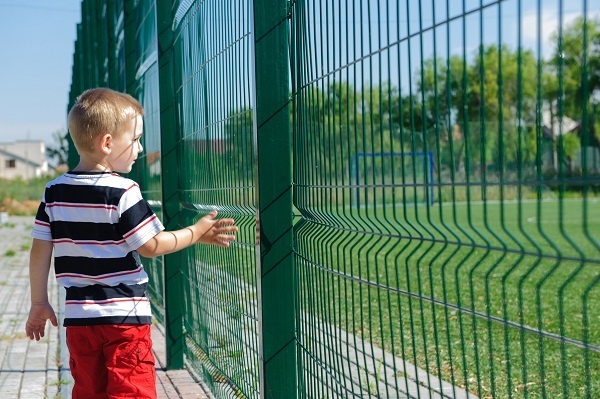 Just like with chain link fencing, welded wire fabric fence can be adjusted to almost any height the school desires. The goal is to protect the children and keep them safe from harm. Expanded MetalExpanded metal fencing is extremely hard to cut or damage and does not unravel easily. This type of security fencing is extremely strong and durable. It comes in several different metal types including galvanized steel, painted, non-painted, stainless steel and aluminum. It can be one of the hardest fences to scale or climb over. Although it will bear the person’s weight, the expanded metal leaves little room for the climber to gain a secure foothold. Expanded metal fences can be erected at any height the school desires. The holes of the fencing are considerably smaller than those of chain link fencing, but they are still large enough to provide maximum visibility when it is needed. OrnamentalOrnamental fencing is very decorative. Aluminum, wrought iron and steel decorative fencing provide an extremely secure, sturdy barrier that keeps children inside and unwanted intruders on the outside. Ornamental fencing is often times made of less material than chain link, welded wire fabric or expanded metal fencing, but the materials that are used are manufactured in such a way that makes it extremely difficult for intruders to breach the perimeter without sustaining some kind of injury. Bars can be placed as far apart or as close together as needed to ensure the maximum level of protection desired. WoodWood is less expensive than many of the other materials. It is easy to install and provides a secure barrier against outside intruders. Wooden fencing also provides the strongest level of privacy than other types. Wooden fencing can be put up in such a way that there is virtually no visibility. Planks can be put side by side or with a slight space between each one. If the planks are closely joined together, it is less likely that an intruder will be able to pry one of the planks away from the fence to allow themselves entrance to the school grounds. Visibility:The level of visibility desired. Privacy:The level of privacy desired. Budget:How much you are willing to spend. Guarantee:What type of guarantee are you looking for? Maintenance:Do you want to make repairs or are you going to hire someone to get them done? Once you have answered these questions, you can begin to look at the above options and consider which type of security fencing is right for you. Individuals who are responsible for choosing the school’s fencing must always take into consideration that children need to feel safe and secure, no matter where they are. This entry was posted in Fencing Guide and tagged Commercial Fencing, Fencing Company, School Fencing, Security Fencing for Safety. Bookmark the permalink.